If you filmed a video on Snapchat that you want to upload to Twitter, Instagram, or your IG Story, you might want to make it longer so that people can appreciate the effect. In this post, I’ll tell you how to create a new video of your Snap playing on repeat using free, online tools. Snapchat videos are often really short - only 1-3 seconds - so it’s more fun when you play the moment on loop. Also, Instagram has a three second minimum, so if you want to post those beautiful selfie videos you’ll need to loop it first. Step 1: Save your Snap to your camera roll Find your Snap clip in your saved Snaps and export it. If you want to use your computer, you can email the file to yourself. Step 2: Go to the Online Loop Video Tool Find the Loop video tool on Kapwing. Kapwing is free and online, so it works on any device and you won’t need to create an account or install anything. Step 3: Upload your video Upload the video from your camera roll or from your computer. Step 4: Select the number of loops After the video loads, choose the number of times you want the video to loop or repeat. You can choose between two and ten loops. Click Create once you’ve set the number of loops. Step 5: Download and share! 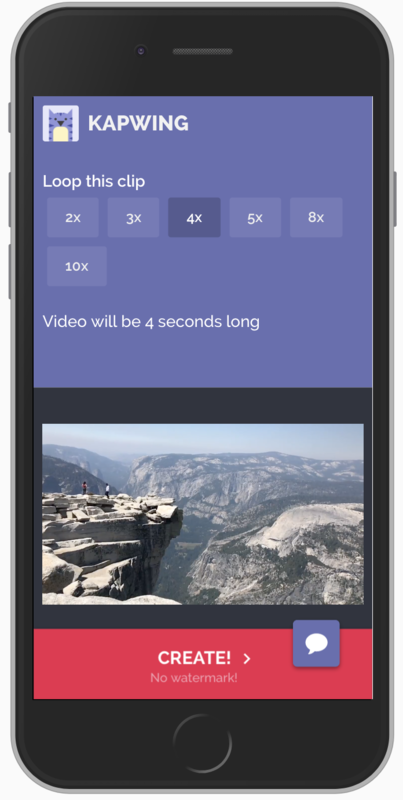 After your video processes, download the looped video and share with your friends! You can publish the video directly to Instagram, Facebook, Twitter, or elsewhere. Thanks for reading! This is the first in a series of blog posts on how you can use Kapwing to accomplish video editing tasks easily online. As always, feel free to reach out to us on Twitter or over email with your feature requests and comments.